I forgot my email password in Outlook 2007, I know what my username is. I just do not remember my password. Is there any way that I would be able to find out what my password is? If you’ve lost or forgotten your Outlook password, you will be unable to access your email account online through a web browser or set up that email account on another computer. This could be a headache thing especially when you have to reinstall the system but can’t afford to lose the email account in your Outlook application. Luckily, there is an easy way to retrieve your Outlook password from the Windows registry. If Outlook asks you to enter your email password and you’ve checked the “Remember password” option, it will save your password in the Windows registry but in a encrypted form. 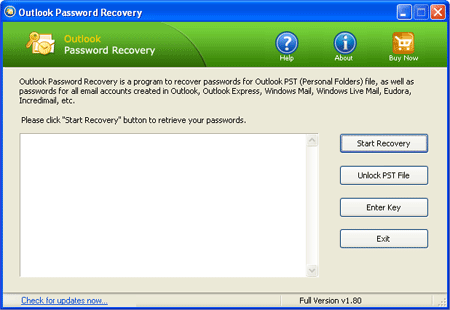 Using Outlook Password Recovery program you can decrypt and retrieve your forgotten Outlook password quickly and easily. How to Retrieve Outlook Password from Registry? Download and install Outlook Password Recovery program on your local computer. After installing, start the program and click on the “Start Recovery” button. The program will begin to search your Windows registry for Outlook email accounts, then decrypt and retrieve your Outlook passwords immediately. After recovering the password, you can save the Outlook passwords along with other account settings into a text file for safe keeping. The method above allows you to retrieve Outlook 2013/2010/2007/2003/2000 passwords from registry on Windows 8/7/Vista/XP. This is not a hacking trick because it requires you to have physical access to your computer. Did you forget Outlook password? How to reset Outlook password without knowing the original password? It is convenient that letting Outlook remember your email account password, so Outlook won’t ask you for the password every time you check mail. After a long time, the password are prone to slip out of your mind. How to reset Outlook password once it is lost or forgot? Resetting Outlook password that you forgot is not so hard as you think. All you need is to get an Outlook password reset tool, which can help you out of the trouble immediately. In this article we’re going to show you how to reset Outlook password quickly and easily. First of all, get Outlook password reset software here: Outlook Password Recovery. It can help you to reset your Outlook password in a few seconds without knowing your original password. The whole task takes you only 3 steps. Install Outlook Password Recovery on your computer. Run the program and then click on Start Recovery button. The program will find out email account logins and passwords remembered by Outlook application. Write the recovered passwords down and access your Outlook. You can reset your Outlook with a new password now. So if you ever lose the password of Outlook account, do not worry just opt for this method and reset your Outlook password quickly and easily. I have been using Outlook for my Gmail account for years. Now I’m going to reinstall the computer and can’t remember my password. I can still access my Gmail account via Outlook as the password is remembered by Outlook application. Is there any way to find Outlook password? Office Outlook is widely used in home and office computers. It allows you to save email password that you use to connect with your email server so that you do not have to retype it every time. However, if you forgot Outlook password you’ll lose your email account after reinstalling Windows or Office application. When this happens, make yourself calm down first, then try to find a password recovery solution. If you don’t have an option, here is my recommendation: Outlook Password Recovery, which allows you to find Outlook password saved in Outlook 2010, 2007, 2003, XP, 2000, 98, 97. It’s the best Outlook password finder utility that enables you to find lost Outlook password in just 3 steps. How to Find Lost Outlook Password? Download and install Outlook Password Recovery tool. Run Outlook Password Recovery, then click the Start Recoverybutton. The program will automatically search Microsoft Outlook profiles. Instantly find Outlook password and display all the login details: email account, username, password, account type (IMAP, POP3, SMTP,LDAP, HTTP) and server name. If your email password is not remembered in Outlook, then you are unable to find Outlook password using this method. You need to contact your email service provider to get back your forgotten password. I have Outlook 2010 configured on my home PC and I want to configure it on my laptop, however, I cannot remember the password. How to recover email password from Outlook? MS Outlook is a really good email, contact and calendar management tool which allows you to add and access an unlimited amount of POP3/IMAP/HTTP accounts. But what if you forgot the passwords of email accounts you have setup in Outlook? How to recover and backup email password from Outlook 2010/2007/2003 in case you have to reinstall Windows or Outlook application? Forgot Outlook password? You can still see your Outlook email account settings except the password. For security reason, Outlook application intelligently hides the password using stars (asterisks or dots). In this article I’ll show you how to recover email password from MS Outlook 2010/2007/2003 if you forgot Outlook password. What you should do first is to download and install Outlook password recovery program on your computer, then follow the steps below to recover your forgotten Outlook email password. Launch Outlook Password Recovery program. Click the Start Recovery button. The program will instantly recover all types of MS Outlook passwords: SMTP, POP3, IMAP, HTTPMAIL, LDAP. The recovery steps are so easy that even kids can do it. Just one click and Outlook Password Recovery program will automatically search your Outlook profiles and recover Outlook password instantly.